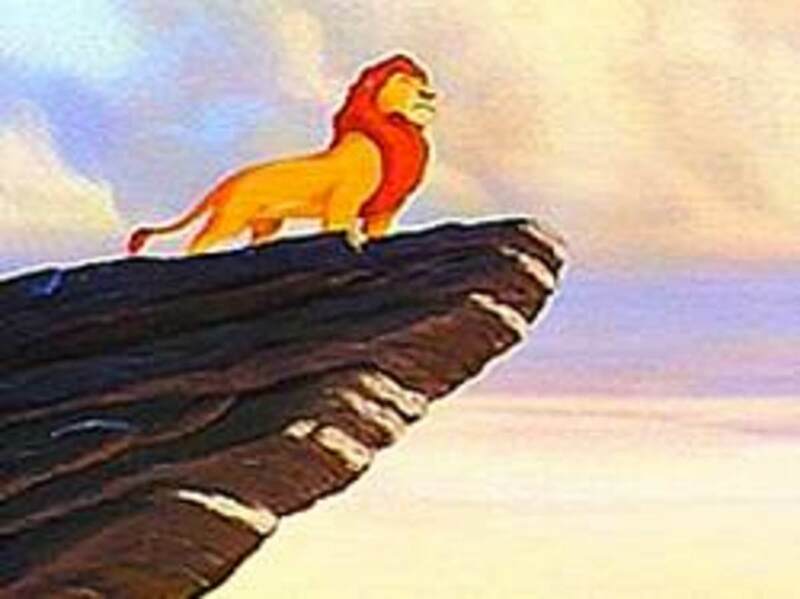 The king of kings, White Lion, is found in wildlife reserves in South Africa. 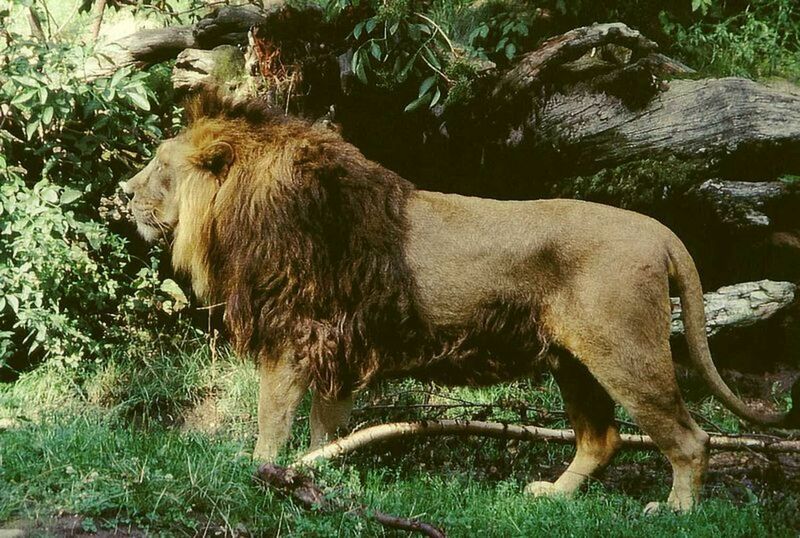 It is a rare colour mutation (genetic change) of a subspecies of lion of Kruger, Panthera leo krugeri. It has been perpetuated by selective breeding in zoos around the world. White lions are not yet a separate subspecies and they have been said to be indigenous to the Timbavati region of South Africa for centuries, although the earliest recorded sighting in this region was in 1938. 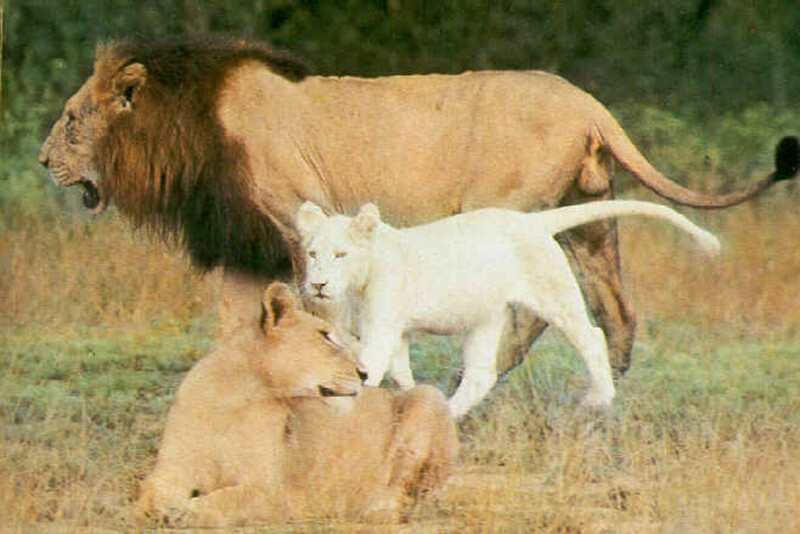 The white lions came in the attention of people in Chris McBride's book The White Lions of Timbavati in 1970’s. Until 2009, when the first white lions were introduced in the wild, it was believed that white lions cannot survive in the wild. This is because a large population of the white lions is in zoo and is bred in the zoo and camps. Mutants are natural variations that occur due to spontaneous genetic changes or the expression of recessive (hidden) genes through inbreeding. Common mutations in big cats are albinism (pure white), chinchilla (white with pale markings), leucism (partial albinism/cream) and melanism (black). 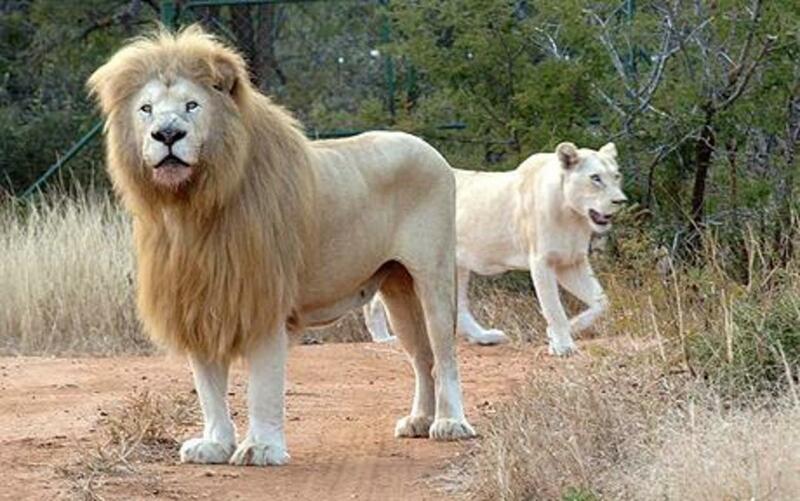 The white lions are also called blonde lions. 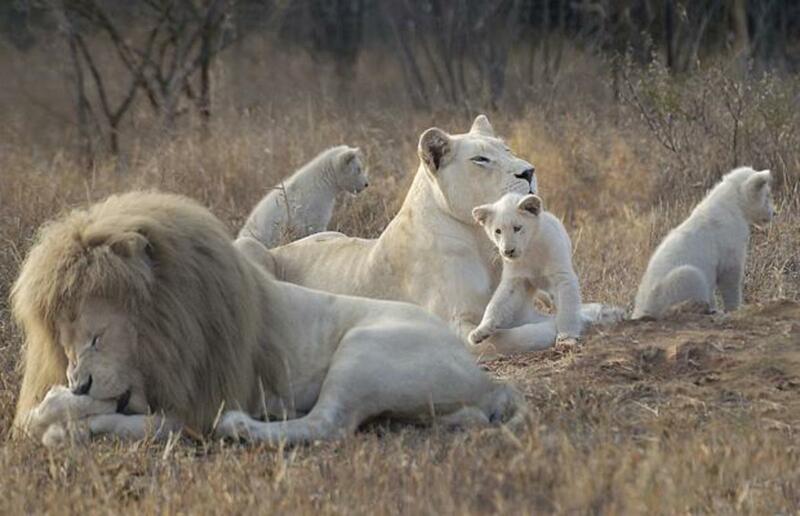 Though they are called white lions, they are not albino (pure white). Rather they are leucistic (partial albinism/cream). Leucistics character is the result of mutation of chinchilla that inhibits the deposition of pigment along the hair shaft, restricting it to the tips. 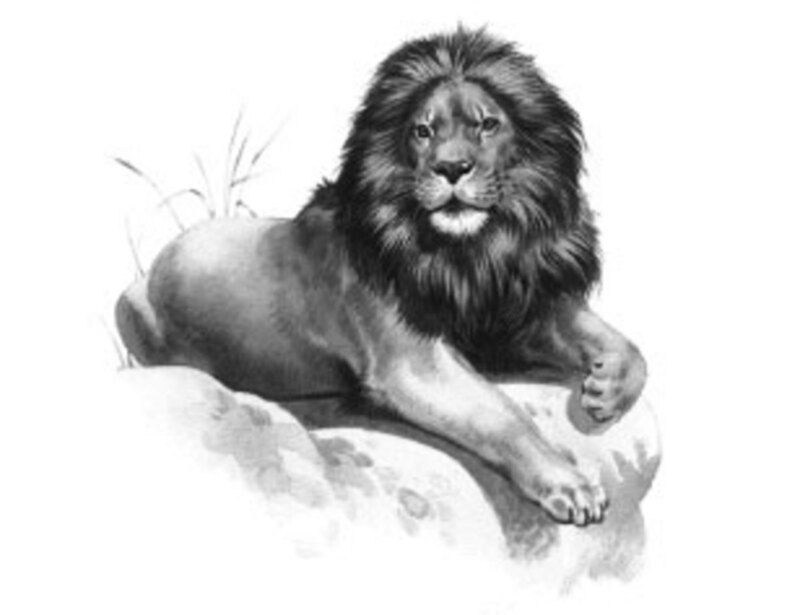 The less pigment there is along the hair shaft, the paler the lion. Hence the colour of white lion ranges from blonde to near white (not pure white). Their pigments are visible in the eyes, paw pads and lips. The eyes of the white lions are same that of the normal yellow lions, that is, golden eyes but bluish, blue-green or greyish-green eyes are also found. At birth, the cubs are snowy white and may be described as resembling polar bear cubs. The birth colour gradually darkens to a pale cream colour known as blonde. The mane and tail tuft remain a paler shade. It is believed that the white lions came into existence during the Ice Age when the yellow lions were facing problems to hunt and hide in white environment. Since the nature always support mutation according to the environment in which the species exist for survival, so the white lions came into existence as mutants (having genetic changes) to ensure the continuity of the species of lions. And since then the genes (unit in DNA that controls characteristics that appears in an individual) of white lions are passed from generations to generations and exists till now in some of the lions. This was proved when two white lion cubs were born from a couple of yellow lion. But the present white lions should be considered as man made lion. The biggest problem in their survival is their colour which makes them so special that they are called king of kings. Because of their white colour they are less successful to camouflage (blend or mix) in their surroundings in the wild than the yellow lions. Hence they face difficulties in hunting as their prey easily recognizes the white coloured lions in yellow or green grass because of the reason that like tigers, lions are also short distance sprinters and needs to reach about 20-30 metres to attack a prey. And they are easily seen by the poachers too. Also their cubs are easily visible by other predators like hyenas etc. This makes their survival less successful. 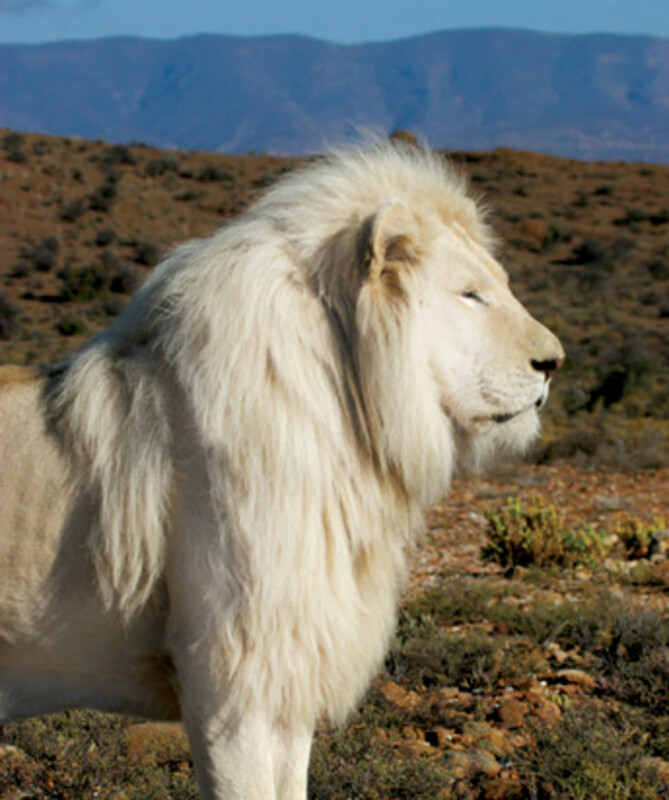 The white lions are considered divine by the locals of South Africa. It has been a part of their folklore since prehistoric times. According to them, white lions are the children of the God Sun who are sent on Earth as gifts. Legends also say that the white lions are the symbols of all the good to be found in all creatures. 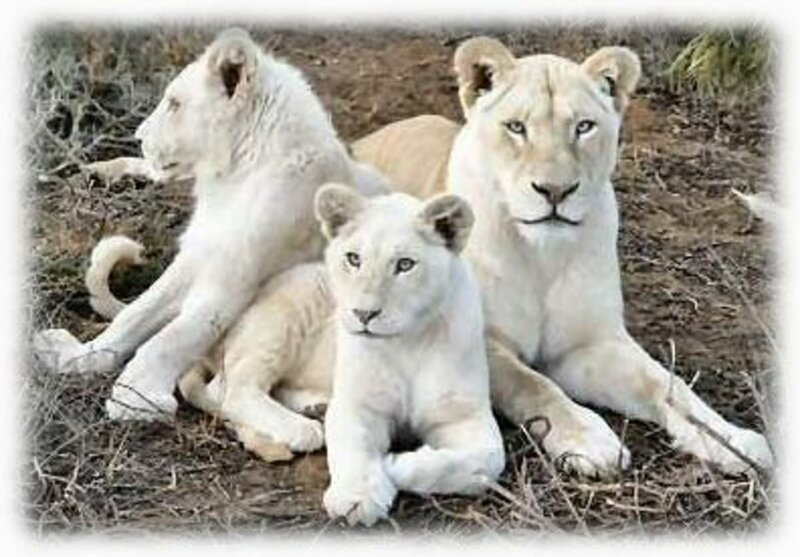 It is also believed according to the Oral traditions that the white lions appeared over 400 years ago during the reign of Queen Numbi in the region now known as Timbavati. A shining star was seen to fall to the ground, but when Queen Numbi and her people approached, they found it to be a shining ball of metal, brighter than the sun. Queen Numbi, who was an elderly and infirm woman, was swallowed by its light and received by strange beings. When she emerged again, she had been restored to health and youth. The fallen star remained there for some days and then rose back into the sky. Animals with strange deformities were born in that region - cattle with 2 heads, white impala and green-eyed white leopards and lions. To this day, white animals are born in Timbavati, including a blue-eyed albino elephant that was shot by white hunters. It is now known that radiation can cause mutations such as those described. There are now around 300 white lions in captivity and they have been returned to the wild. The white Lions are currently classified as ‘Panthera leo’ under the general species classification. This classification is likely to change after the genetic research and it may also reveal the important reason for the sub-speciation of this rare phenotype(external appearance). The genetic marker that makes a lion white has not been identified as yet. The white lions are not albino as pigmentation is present which is apparent in the eyes, lips and paw pads. This condition is termed leucism wherein there is loss of pigmentation in the skin and fur with normal color in the eye which is present in the white lions. However, the mystery as to why this condition is seen only in the lions of the Timbavati area is still not resolved. Further, it has been proposed that the white lions are scientifically inferior to ordinary tawny lions and also that white lions cannot survive in the wild as they lack camouflage. However, these theories have not been tested scientifically as yet. White lion is pretty rare and not many people know about it. Did you know about white lions before reading this article? 100 Pictures of Lions - Sleeping, Hunting, Roaring, with Cubs, and More! ALL My Pleasure. I consider you my New Friend and I encourage you to keep on writing tremendous hubs like this one and you will surely taste plenty of success. I'm glad you liked this hub. I love cats too. Very much! Hope you're having a great day..! Loved this piece. That is natural since I LOVE cats big and small. I would love to pet a Bengal Tiger or even an Amazon Panther. I shared this with my other followers. Interesting hub this is the first time I have heard of white lions. What a great hub! they are so beautiful aren't they? great info, and photos, wonderful! I thoroughly enjoyed this hub! Great hub.... beautiful pictures. Did you worked a lot for making this hub yar? Enjoyed your hub very interesting. The lions are so beautiful. Voted up and shared. Excellent hub Sneha Sunny! Very interesting facts about those lions! I thought they were albinos until I read your explanations! They are so beautiful animals! suzettenaples.... I'm glad you found this hub useful! Yes, a lot of animal species show mutations, including the big cats. What an interesting article. I had no idea there were white lions. This is the first time I have heard or seen pictures of them, so thank you for writing this. Every animal species has its mutations so it would figure lions would too. Thanks for an informative article! Beautiful lions! Thanks for sharing, Nithya. They are rare and should be protected. Very interesting topic...that of white lions. I have written a hub titled Secret Garden in Mirage Hotel ~ White Tigers and Lions ~ Las Vegas, Nevada. People can see both white tigers and lions there as well as other animals. Those are interesting mythologies. Up, useful and interesting votes and I am going to add a link from this hub to mine. Will make a nice addition. Thanks for writing this hub. Au fait.. Thanks a lot. They are really fascinating. Gypsy rose.... thank you for stopping by and commenting. It is always appreciated! Elias.... that's true. We can't do anything about that. They're beautiful but rare. sgbrown.... I'm glad you're here.... I too want to see them in person. It would be great moment, not something you get see everyday! Yes, nature is so beautiful, creative and amazing! I'll surely check out your hub! And ofcourse you can share this hub in your wildlife blog! @Jane... thank you... I'm glad that you enjoyed reading my hub! An interesting hub. I had not heard of the white lion before. Great information and enjoyable to learn about. Thanks for sharing. Voted up and pinned. Fascinating creatures; love their color! I guess I'll never have the chance to see one of them at close range but what can you do eh!? Wow what a beautiful hub and I now look forward to so many more by you. Thanks for such a nice hub. Voted up and interesting.Thanks for sharing this fascinating and informative hub on white lions. Just love these majestic animals. Great pics and passing this on. I have never heard of these lions before. A very interesting hub packed with lots of information! Appreciate the work you put into this. I enjoyed learning something new. Voted up, interesting, and beautiful! Will share with my followers. 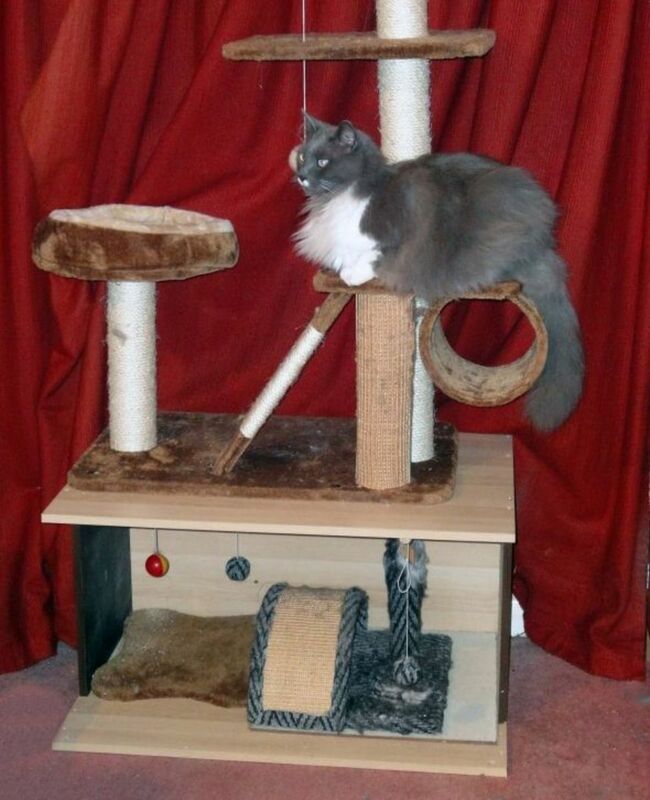 What, what great cats these are. I enjoyed your hub. Keep up the good work. Wow! These are beautiful cats. Great hub! I share your love of animals and we have just got some white lions at the Toronto Zoo which is just minutes from my house! I can't wait to see them. A wonderful piece on this great rarity. It definitely is hard to hunt with this camouflage difficulty, so it is one of those rare times that I do advocate human care. It is a mystery why it happens, though. Thank you for telling us all about them. These are beautiful, beautiful animals, and your hub is an interesting read. Up and buttons! Great hub!! beautiful pictures, very well researched and written!